It doesn’t look like much, does it? 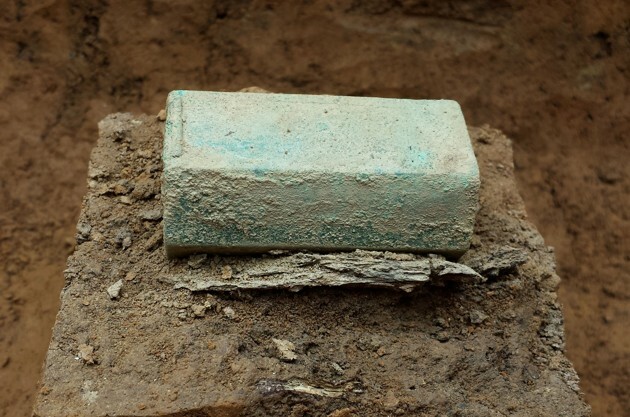 But this little silver box, now turned green with age, could change a lot of what we understand about early Jamestown. According to the archaeologist James Horn, of the Jamestown Rediscovery Foundation, it was found next to the remains of Gabriel Archer, one of the colony’s first leaders, and has been identified as a Catholic reliquary. Not particularly welcoming would be an understatement, I think. This was not purely a question of religion, after all, but of international relations. England and the Church of England were, in the figure of the monarch, one. And the great enemy of England—even if James I had tried to cool things off a bit—was Catholic Spain. The founding of Jamestown, in fact, can best be understood in the context of England’s rivalry with Spain over control of America and her riches, real and potential. Colonists were executed in early Jamestown (a man named Kendall, for one) not for being Catholics exactly but for being Spanish spies. Although the English colonists might have found such distinctions to have been beside the point. This, then, is why a little silver box is such a big deal. Gabriel Archer was a major antagonist of John Smith and his leadership of the colony. (Archer was on the council when the body sentenced Smith to hang for the offense of having been caught in a deadly Indian ambush.) Could there have been more going on than merely two men who intensely disliked one another? But there’s still a nagging question in all this: What if the box wasn’t a Catholic relic at all? Such symbols have histories that are, at times, “messy,” Horn acknowledged. So don’t go rewriting your histories quite yet!